With a single-point support portal we are focused on your smooth experience with our library. Selected by 863 commercial and 33 open source projects worldwide since 2007. Created by a team with years of hands-on experience of integrating Java code. * Copyright (c) 2000- TeamDev Ltd. All rights reserved. * Use is subject to licence terms. * navigate to the "www.google.com" website. You can take a screenshot of a web page including hidden scrollable area and save it as an image file. This functionality can be used in developing a web service that provides image of a web page by its URL or for automated tests when you need to compare screenshots of the same web page to find regression and changes. JxBrowser supports two rendering modes: lightweight and heavyweight. In lightweight (off-screen) rendering mode Chromium™ engine renders web page off-screen using CPU. In heavyweight (GPU-accelerated) mode the engine renders content into a native window embedded into your Java application using GPU. Learn more. JxBrowser allows displaying Adobe Flash content. You will need to have PPAPI Flash plugin installed. DocumentLoadedInMainFrame Render process events such as RenderCreated and RenderGone are also available. See example. You can find required HTML elements by tag name or ID, get/set HTML element attributes, listen to different DOM events such as click, mousedown, keydown, keyup, load, unload etc. See example. With NetworkDelegate you can handle basic, digest, NTML, and Proxy authentications. Learn more. The component displays images generated by Chromium engine. Because of this web pages will look exactly as in Google Chrome™. Using the CookieStorage object you can receive all the cookies including secure and HTTP-only ones, delete all the cookies or a specific one, create and register new cookies. See example. such as context menu location, selected text, link URL, link text, HTML element media type etc. See example. JxBrowser allows getting image representation of the loaded web page including the hidden scrollable area. The image can be saved in PNG, JPEG and other graphic formats. See example. JxBrowser allows getting image representation of the loaded web page including the hidden scrollable area. The image can be saved in PNG, JPEG and other graphic formats. See example. The LoadHandler allows you to handle navigation to any URL address and cancel it when it's necessary. See example. NotificationHandler allows you to tackle the situation when web page wants to display desktop notifications. You can build and display your own Swing/JavaFX notification when necessary. Or you can disable desktop notifications at all. You can configure each Browser instance to use its own proxy settings. Various configurations are supported: auto detect proxy, manual proxy configuration for HTTP, HTTPS, FTP, SOCKS protocols, direct proxy, proxy auto configuration files. See example. You can use JxBrowser library in Java applications that are deployed via Java Web Start or Java Applet. Read more in the Documentation. All pop-up windows can be handled with PopupHandler. It is you who decides whether a pop-up window should be displayed or not and how exactly you want it to be displayed (e.g. in a separate window, in your application tab etc.). See examples. With JxBrowser you can set your own user-agent for all Browser instances. See example. DownloadHandler allows you to handle file downloads and control whether a file should be downloaded or not. You can also receive notifications about download progress, speed, completion percentage, received bytes etc. See example. When a user clicks the file upload INPUT element on a web page, the DialogHandler.onFileChooser() method will be invoked. Using this method you can display your own file chooser dialog where a user can select a file to upload. You can filter all keyboard and mouse events before they are passed to the Chromium engine. See example. Browser.saveWebPage() allows you to save the loaded web page as a set of files. See example. Java™ WebStart version 1.8 recommended. During your evaluation and an active support subscription you can submit requests related to your project on our support portal. We answer questions with #jxbrowser tag on Stack Overflow. Your support is phenomenal... Your responsiveness is really helpful... I continue to be impressed with you and your team. John Michelsen, iTKO, Inc.
JxBrowser is using Blink and FFmpeg components, supplied under LGPL. What platforms does JxBrowser support? 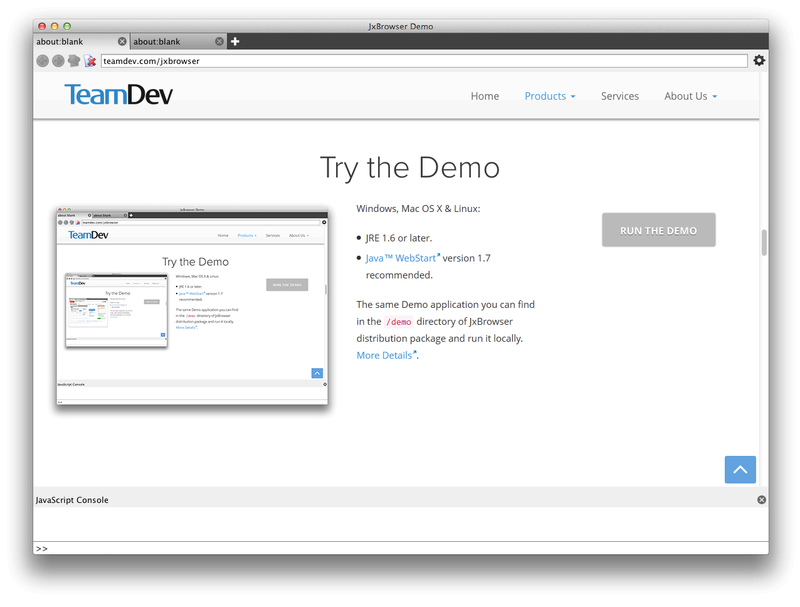 JxBrowser runs on Windows, macOS, and Linux. More information on supported platforms is available on the System Requirements page page on the product support site. Do my users need to install Chrome? No, all the required Chromium binaries are deployed with JxBrowser library. You even don’t need to install Google Chrome to work with JxBrowser. What Chromium build does JxBrowser use? Actual JxBrowser version is based on Chromium 69.0.3497.12 build. Can I use JxBrowser in Java Applet and Java Web Start applications? Yes, you can use JxBrowser in Java Applet and JWS applications like a standard Java library. You can find more information about it in JxBrowser Documentation. You can find a lot of examples in JxBrowser distribution package and online in our Documentation. What changed in licensing for new version 6.x? First of all there are no more runtime files. You will only receive one license file to use for development and distribution of your applicatons including our library. Also, you are now eligible for all updates, both major and minor, during your active Standard Support subscription period. Please take a look at the License Changes page devoted to the licensing changes for more detailed information. What are the terms for using JxBrowser? There are 6 people on our team, and 2 of them need to use JxBrowser. How many licenses do we need to purchase? If we take a developer, working with JxBrowser, off the project, can we reassign the license to another developer? How many copies of my product can I distribute with JxBrowser included? We have 5 people, who work with JxBrowser on one product. Upon the license purchase you will receive a license archive. The archive will contain a licence.jar file. This license should be used in the development process and included in your application when distributing it to the end users. Inside the license.jar you can find the teamdev.licenses file that contains information about your license. We need to look at the Source Code of JxBrowser, do you provide it? Yes, you can purchase JxBrowser Source Code License; it is provided on a per developer basis. Please contact our sales team if you are interested in this option. Chromium code is mainly provided under a permissive BSD license, however, some components it includes are supplied under different licenses. We have reviewed the licenses for all components included in JxBrowser and referenced them here. There are no requirements to disclose your proprietary code. If the message gets lost in your mailbox, try searching for an email from JxBrowser Evaluation Support with “Your Free 30 Days Trial” subject. Check out the ready-made examples for instructions and ideas on what you can do with your newly gotten JxBrowser. The evaluation license will not work after this time. If you are doing an open source project, you can request a permanent licence via the link provided in the email you will receive.